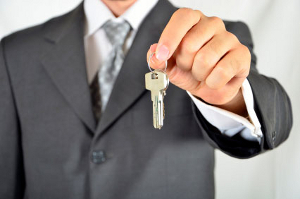 At a closing, ownership of the newly purchased home is transferred to you. It involves you, the seller, the real estate agent, representatives from the title or escrow firm, clerks, secretaries, attorneys and other staff. It is possible to have an attorney act on your behalf if you cannot attend the meeting (for example if the house is in another state). Closing can take as little as an hour to sign all the forms and transfer ownership or can take several hours, depending on the contingency clauses in the purchase offer. Much of the paperwork involved in closing is done by attorneys and real estate professionals. You may be involved in some of the closing activities and not in others, depending on the professionals with whom you are working. Before you close on the house, you should have a final walk-through, to make sure any repairs you requested are completed and that items which were to remain with the house are still there. More information can be found on our Closing Checklist. In most states, the settlement is done by an escrow firm to which you forward all the materials and information along with a cashiers' check. The real estate agent or another representative of the title company will deliver the check to the seller and the house keys to you. The Real Estate Settlement Procedures Act (RESPA) has information on the closing costs you are likely to have. Within three days of you applying for the mortgage, your lender is required to provide a "good faith estimate of settlement costs," based on his or her understanding of your purchase contract. This estimate should give you a good idea of how much cash you will need at closing to cover prorated taxes, first month's interest, and other settlement costs. The act also requires lenders to give you an information booklet. The Settlement Costs Booklet, written by the U.S. Department of Housing and Urban Development, discusses how to negotiate a sales contract, how to work with various professionals (attorneys, real estate agents, lenders), and your rights and responsibilities as a home buyer. One business day before you close, you're entitled to see a copy of the Uniform Settlement Statement with your figures on it, that way you'll know how much the final costs will be.